Miserable Pile of Secrets: Here's to twenty more! It's apparently twenty years this month since Nintendo's original Game Boy debuted in North America. I am unable to find a more exact date for this anniversary, but just the year is enough to shock me. I would not have been six years old at the time. I was really too young to be playing video games anyway, but the trickle of industry news was also much slower, so it was entirely possible that a major hardware launch of a completely new gaming platform could escape my notice. The unveiling of Gunpei Yokoi's handheld did not register as a watershed moment in my life, but, in hindsight, my subsequent acquisition of it was a game-changer. I believe I got mine for Christmas '89, or it may have been my birthday the year after. I do remember that I was all set to get a Mario plush as my present from my parents. 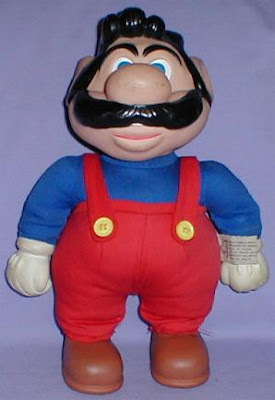 Mario was perhaps an even bigger deal then than he is now; although I didn't play the games, I loved the character just the same as I loved Mickey Mouse or Bugs Bunny. So when my mother asked me what I wanted, that was my answer, and it was all but decided weeks in advance. Then, just days before we were to go shopping, my brother suggested that I get the Game Boy instead, pointing to an ad and describing it as a handheld junior version of the Nintendo. I pictured something like the Game & Watch (we had Balloon Fight and Bombsweeper, as well as an excellent VTech clone called Diamond Hunt) or those Tiger Electronics LCD handhelds. I didn't really understand, but I caved easily to my older sibling's influence. My mother was happy to get me whichever present I chose, even though, unbeknownst to me, the Game Boy cost several times what the plush went for. When we did go shopping at Toys "R" Us, there were rows upon rows of the popular Mario plush. I was able to get a hands-on, and, as it turned out, it was not very soft or much fun to play with. This was also well before the character had a fully realized and consistent three-dimensional form, so, while I don't remember anything seeming amiss back then, I doubt my warmth for it would have lasted as long as it has for the Game Boy. On the other hand, if I had gotten it instead of the Game Boy, I might never have played a Mario game, and I might consequently have fallen out of love with the character anyway. Suffice it to say, as much as I thought I wanted the Mario, I have never regretted having gone with the Game Boy. For the longest time, the only Game Boy games we had, besides the pack-in Tetris, were Super Mario Land, Teenage Mutant Ninja Turtles: Fall of the Foot Clan, and Paperboy. Through most of the system's life cycle, I operated with the misguided belief that Game Boy developers only made unambitious child games not worthy of my enthusiasm. I don't know how I reconciled that attitude with the reality that I played each of the games in my Game Boy collection more than all my family's NES games combined. Originally, my favorite by far was TMNT. I was a huge fan of the cartoon, and, back then, the turtles were truly multimedia heroes. With Konami handling the license, the video games were consistently excellent. I particularly appreciated that Fall of the Foot Clan was a very easy game. For a kid whose previous gaming experience consisted only of Combat for the Atari 2600, Super Mario Land required too much manual dexterity, and I didn't understand the narrative-free Tetris. I would come around to those games later, but TMNT included stage select as a default option, allowing me to skip to the last level without having to survive the buildup. Somehow the idea would still be considered innovative when Alone in the Dark did it in 2008. I don't know why, but one of my most vivid memories of my childhood is from the day I got my Sega Game Gear. What I remember is that, the moment I got home, I sat down and started playing Super Mario Land on my Game Boy. I wasn't making a statement, but my brother cracked some joke about how I was still playing yesterday's machine. Actually, I was waiting for him to unpack and set up the Game Gear. I would be enjoying Columns and Sonic the Hedgehog shortly thereafter. But I would still end up going back to Super Mario Land far more often.